Old German tool, what was it used for? It is German, I'd guess from the early 1900's. "Kinda functions like a garlic press" is about as accurate as you're going to get without knowing if there are any other parts to it. 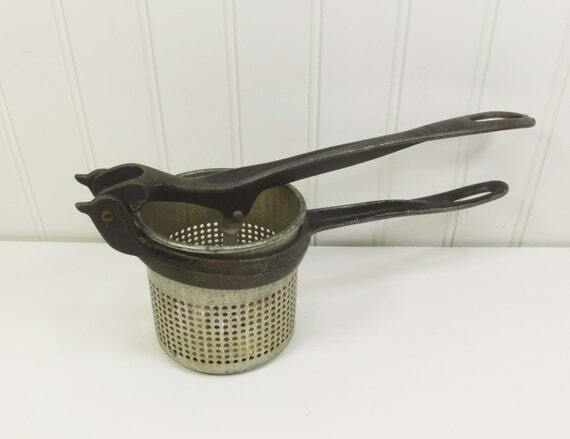 It may have been a ricer, masher or, as other have said, it may have been for pressing holes in a material, or it may have been for compressing something into a cup or container (like the espresso scoop/filter things). Really, all you can say for certain is that it was for pushing something into or through something. Ockham's razor. Though it is a bit unique with the skeleton handles; most are solid. It is probably not a spaetzle press. They usually have a pot tab or ring opposite the handles. I had to chuckle at substituting masher for ricer in German potato _______. Vintage Hand Press for processing food. geschüzt means protected, It's a kind of patent mark. My grandparents had a very similar one and as Quadrifoglio pointed out there is a "basket" that goes along with it. We had three with different hole sizes in the bootom of the basket to make pasta and things like that. Only real difference to yours was that ours was made from cast aluminium. If you want to preserve it dunk it in coke or phosphoric acid for a day or two. All the fine rust will turn black giving it a nice old look without the ugly rust. It looks like a juicer / ricer, missing the basket.